Breast cancer is a heterogeneous disease consisting of different subtypes. Trichorhinophalangeal syndrome type 1 (TRPS1) gene, a GATA-type transcription factor, has been found to be highly expressed in breast cancer. Epithelial-to-mesenchymal transition (EMT) is known to play an important role in tumour invasion and metastasis. Our objective was to elucidate the different roles and clinical relevance of TRPS1 in different estrogen receptor (ER) expression subtypes of breast cancer. An immunohistochemical study was performed. The correlation between clinicopathological features and other biomarker profiles were analysed statistically. TRPS1 expression was correlated with the patients’ age (P = 0.017). It was positively related with ERα (P < 0.001), progesterone receptor (PR) (P < 0.001) and ERβ (P = 0.001) status, but negatively associated with Ki67 (P = 0.002) and HER2 (P = 0.025) status. In ERα-positive breast cancer, TRPS1 expression was positively associated with the expression of E-cadherin (P < 0.001), β-catenin(P = 0.001), ERβ (P = 0.03), and p53 (P = 0.002) status, while in ERα-negative breast cancer, TRPS1 expression was correlated with slug (P = 0.004), vimentin (P = 0.003), smooth muscle actin (SMA) (P = 0.031), and IMP3 (P = 0.005) expression. Based on our findings, we conclude that TRPS1 is positively associated with E-cadherin and β-catenin status in ERα-positive breast cancer cells, while it is also significantly associated with mesenchymal markers of EMT in ERα-negative breast cancer cells. TRPS1 can be a prognostic marker depending on the type of breast cancer. Breast cancer is one of the most common cancers in women, accounting for more than 1,300,000 cases and 450,000 deaths worldwide each year . Breast cancer is a heterogeneous disease that comes in different morphological and immunohistochemical characteristics with corresponding clinical behaviour . The oncogenesis and progression of breast cancer is a complex process involving a variety of transcription factors, activation of oncogenes, and inactivation of tumour suppressor genes [3, 4]. Recently gene expression profiling and immunohistochemistry (IHC) studies have been identified Tricho-rhino-phalangeal syndrome-1 gene (TRPS1), a new GATA family member, to be highly prevalent gene in breast cancer [5, 6]. TRPS is an autosomal dominant genetic disorder characterised by craniofacial and skeletal anomalies due to mutations or deletions of the TRPS1 gene. It is composed of nine zinc finger motifs including a single GATA-type DNA-binding domain flanked by two potential nuclear localisation signals (NLS) and two C-terminal zinc fingers closely related to the domain found in the Ikaros family of lymphoid transcription factors . It has been demonstrated that TRPS1 is a transcriptional repressor and its activities are dependent on both the highly conserved GATA DNA-binding domain and the Ikaros-like zinc finger motifs . For example, TRPS1 can repress Stat3 to regulate proliferation and apoptosis of chondrocytes. TRPS1 controls epithelial proliferation through repressing SOX9 in the developing vibrissa follicle in mice. It can also repress the expression of Runx2, a key regulator of osteoblastogenesis and chondrocyte maturation . Moreover, TRPS1 can suppress the osteocalcin expression through binding to its promoter . As mentioned before, TRPS1 gene in human has been found to be overexpressed in breast cancer, expressed in more than 90% estrogen receptor α (ERα) positive and negative breast cancer subtype . The gene is localised on human chromosome 8q23–24.1, a region highly amplified in several cancers, especially in prostate and breast cancer. It is important to note that TRPS1 gene has been found to be highly expressed not only in the mammary glands but also in prostate, testis, ovaries, kidneys, and lungs . Increasingly, there are more evidences to suggest the involvement of TRPS1 in a variety of functions in human cancers [12–15]. Recent studies have reported that TRPS1 can regulate mesenchymal-to-epithelial transition (MET) during embryonic development in a number of tissues, including kidneys, cartilages, and bones [10, 16, 17]. Epithelial-to-mesenchymal transition (EMT) was first recognised as an important process during normal embryonic development ; however, carcinoma cells are also capable of reactivating EMT during tumour progression [19, 20]. During this transition, tumour cells lose epithelial characteristics such as cell apical-basal polarity, membrane-associated adherents, and cell-to-cell adhesion protein E-cadherin. Concurrently, these tumour cells also undergo a dramatic remodelling of the cytoskeleton to facilitate cell mortality and invasion; the cells are also transformed to obtain a spindle-like phenotype. A key feature of EMT is a gene switch, resulting in downregulation of E-cadherin and upregulation of vimentin, smooth muscle actin. Transcriptional factors, such as snail, slug, and twist, which function by suppressing the expression of epithelial specific adhesion molecules, such as E-cadherin, were unveiled as key regulators inducing EMT in breast cancer and other cancers [21–24]. β-catenin was first identified as a protein that binds with E-cadherin to maintain cell-to-cell adhesion; however, it also functions as a transcription factor. Loss of membranous β-catenin expression and gain of cytoplasmic or nuclear β-catenin expression in neoplastic glands have been related to carcinogenesis and tumour progression in gastrointestinal cancers [25, 26]. Thus, by detecting these EMT markers, one can roughly estimate the tumour cells undergoing EMT from non-EMT tumour cells. In addition to the involvement of TRPS1 in regulating MET, it has also been found to repress ZEB2, a key regulator of EMT that inhibits E-cadherin and other epithelial genes . Realizing the potential of TRPS1 gene as the new EMT marker, we focused our work in elucidating different roles and clinical relevance of TRPS1 in ERα-positive and ERα-negative breast cancer subtypes. This study was conducted on 180 paraffin-embedded breast samples, which were histopathologically diagnosed invasive ductal carcinoma during 2007 to 2009 at the Department of Pathology of Qilu Hospital of Shandong University. For using these clinical materials for research purposes, prior patient consent and approvals from the Research Ethics Committee of Shandong Medical University were obtained. All the diagnoses were made following the Pathology and Genetics of Tumours of the Breast and Female Genital Organs of World Health Organisation Classification of Tumours. For each hematoxylin and eosin (H&E)-stained slide, two representative areas were selected and the corresponding spots were marked on the surface of the paraffin block. Using a tissue microarray (TMA) punching instrument, the selected areas were punched out and were placed into the recipient block side by side. Each tissue core was 2 mm in diameter and was assigned with a unique TMA location number that was linked to a database containing other clinicopathologic data . 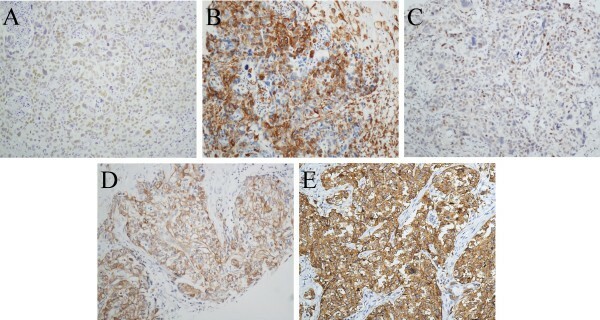 The immunohistochemical study was carried out to examine altered protein expression in 180 paraffin-embedded breast tissues as described in previous publications . All the markers were incubated with the sections overnight at 4°C; the markers included TRPS1 (sc-26974, diluted 1:200; Santa Cruz Biotechnology, CA, USA), P53 (Zhongshan Golden Bridge Biotechnology, ZSGB-Bio, Beijing, China), E-Cadherin (24E10, diluted 1:400, Cell Signalling Technology, USA), mouse monoclonal antibody β-catenin (E-5, diluted 1:500, Santa Cruz Biotechnology, CA, USA), Vimentin ( D21H3, diluted 1:100, Cell Signalling Technology, USA), slug (C19G7, diluted 1:50, Cell Signalling Technology, USA); the second antibody was from IHC reagent kit (Zhongshan Biotechnology Company, Beijing, China). After diaminobenzidine (DAB) staining, the sections were counterstained with hematoxylin. For negative controls, the antibodies were replaced with phosphate buffered saline (PBS). The stained slides were reviewed and evaluated independently by two observers blinded to patients’ information. A dual semi-quantitative scale, combining the staining intensity as well as percentage of positive cells, was used to evaluate the protein staining. In brief, staining of TRPS1 was scored semi-quantitatively for intensity (0 = no expression, 1 = weak, 2 = moderate, and 3 = strong) and percentage of positive cells (0 = 0–10%, 1 = 10–30%, 2 = 30–50%; 3 = 50–80%, and 4 = 80–100%). The final score of TRPS1 was the staining score multiplied by the percentage of positive cells. The following cut-off levels were applied: 0 for negative and ≥ 1 for positive . For β-catenin, membrane and cytoplasmic/nuclear expression were recorded separately as no staining, weak staining, or strong staining. Cases with more than 50% of nuclei stain were considered nuclear staining while cases with more than 50% of cytoplasm stain were considered cytoplasmic staining . ER or PgR was positive if 1% of tumour cell nuclei were immuno reactive . For other molecular markers, tumours were regarded as immune-positive if > 10% of tumour cells showed immunoreactivity. Cytoplasmic staining was considered positive for vimentin and SMA. Nuclear staining was considered positive for TRPS1, ERβ, slug and P53. Membranous staining was considered positive for E-cadherin. Statistical analyses were performed using the statistics software package SPSS 18.0 (SPSS, Chicago, IL). Chi-square test or Fisher’s exact test were performed to evaluate the correlation between TRPS1 expression and clinicopathologic characteristics, if appropriate. Bivariate correlations between study variables were calculated by Spearman’s rank correlation coefficients. Differences were considered statistically significant for P values < 0.05. In the analysis of a 180-member TMA, we found positive TRPS1 expression in 93 cases (51.7%), while 87 tumours (48.3%) were negative. Table 1 shows no significant correlation between the expression level of TRPS1 and biological factors such as histology grade (P = 0.903), pathological stage (P = 0.646), tumour size (P = 0.343), lymph node metastasis (P = 0.443), P53 status (P = 0.113), and IMP3 status (P = 0.618). In contrast, we found that TRPS1 expression was strongly correlated with the patients’ age (P = 0.017), Ki67 (P = 0.002), ERα (P < 0.001), progesterone receptor (PR) (P < 0.001), HER2 (P = 0.025), and ERβ status (P = 0.001). Spearman correlation analysis was preformed to confirm further the correlation between TRPS1 expression and patients’ age (−0.179, P = 0.016); Ki67 (−0.233, P = 0.002), ERα (0.333, P < 0.001), PR (0.31, P < 0.001), HER2 (−0.166, P = 0.025), and ERβ status (0.242, P = 0.001). We divided the patients into two groups as ERα-positive and ERα-negative. TRPS1 expression was observed in 69 (65.7%) of 105 ERα-positive patients, while in 24 (32%) of 75 ERα-negative patients. As TRPS1 may be a critical regulator of EMT during breast cancer initiation and progression, the expression of EMT markers, including E-cadherin, β-catenin, vimentin, SMA and slug, were stained in human breast cancer TMA. Statistical analysis indicated that the immunohistochemical expression of TRPS1 is directly correlated with E-cadherin (P = 0.002) and β-catenin (P = 0.003), which was further confirmed by Spearman correlation analysis (E-cadherin: r = 0.231, P = 0.002; β-catenin: r = 0.221, P = 0.003) (Table 1). Moreover, we also found that TRPS1 expression was significantly correlated with slug (P = 0.019), vimentin (P = 0.022) and SMA (P = 0.039); the corresponding Spearman correlation values are 0.186 (P = 0.012), 0.171 (P = 0.022), and 0.154 (P = 0.039). We analysed the molecular markers in ERα-positive breast cancer. Table 2 shows the expression of TRPS1 is positively associated with E-cadherin (P < 0.001), β-catenin (P = 0.001), ERβ (P = 0.03), and p53 (P = 0.002) status (Figure 1). However, the TRPS1 expression is not associated with slug (P = 0.549), vimentin (P = 0.296), SMA (P = 0.296), and IMP3 (P = 0.605). Expression of markers in ERα -positive breast cancer (Magnification 200X). A. Positive nuclear staining for TRPS1, B. Positive membranous staining for E-cadherin, C. Positive membranous staining for β-catenin, D. Positive nuclear staining for ERβ, and E. Positive nuclear staining for P53. 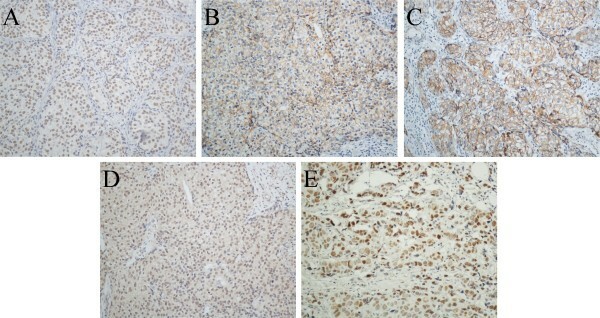 For ERα negative breast cancer cases, Table 3 shows that the immunohistochemical expression of TRPS1 has correlation with slug (P = 0.004), vimentin (P = 0.003), SMA (P = 0.031), and IMP3 (P = 0.005), which was further confirmed by Spearman correlation analysis (Figure 2). Expression of markers in ERα -negative breast cancer (Magnification 200X). A. Positive nuclear staining for TRPS1, B. Positive cytoplasmic staining for vimentin, C. Positive nuclear staining for slug. D. Positive cytoplasmic staining for SMA, and E. Positive cytoplasmic staining for IMP3. Breast cancer is a heterogeneous disease consisting of multiple molecular subtypes. The presence of hormone receptors ER, PR, and human EGFR-2 (HER-2) are significantly meaningful in therapeutic decision-making for patients with breast cancer. In addition, these factors may also predict the probability of disease relapse. Hormone receptor-positive tumours have favourable outcomes because of their response to endocrine manipulations such as tamoxifen, aromatase inhibitors, or ovarian ablation . Tumours with ERα-negative phenotype tend to have poor prognosis, unlike their hormone receptor or HER-2 positive counterparts; hence, such ERα-negative tumours lack targeted therapeutics. Next, we investigated the expression of TRPS1 in primary human breast cancer samples and explored its association with major breast tumour histological specialties and patients’ clinical characteristics. TRPS1 was positively associated with ER and PR expressions and negatively associated with HER2 status, which is consistent with previous study . When the cut-off level score for TRPS1 to be positive is 1, the TRPS1 was not remarkably associated with the tumour grade, pathological stage, tumour size and lymph node metastasis. However, upon changing the cut-off level score of TRPS1 to be positive as ≥ 2, TRPS1 was found to be positively associated with lymph node metastasis and P53 status (data not shown). However, previous studies showed that higher TRPS1 expression, when analysed using univariate and multivariate models, predicted better overall survival (OS) and disease-free survival (DFS) in a subgroup of ERα+, stage I/II breast cancer patients who received endocrine therapy only . Recent studies have also confirmed that high TRPS1 expression was significantly associated with lymph node metastasis and higher pathological stage of patients with colon cancer . All these findings support our hypothesis that TRPS1 may not merely be an indicator of better prognosis as shown in other studies. However, further research using larger patient cohort and more breast cancer cell lines is required to elucidate this contradictory result. Epithelial cancer cells attain mesenchymal features that make them easier to invade the surrounding tissues and metastasise during EMT process. We used IHC to analyse these markers in 180 patients. Although TRPS1 was significantly associated with E-cadherin and β-catenin, it was also positively associated with mesenchymal markers such as vimentin, SMA, and slug. The above data did not comply with previous results that TRPS1 inhibits EMT process in breast cancer progression . Hence, we divided the patients into two groups as ERα-positive and ERα-negative and reanalysed these EMT markers. Surprisingly, in ERα-positive breast cancer, we found TRPS1 to be positively associated with E-cadherin and β-catenin status with no significant correlation with any of the mesenchymal markers. Consistent with our hypothesis, significant association was also found between TRPS1 expression and E-cadherin expression in ERα + breast cancer cases . In ERα-negative breast cancer, we found TRPS1 to be positively associated with vimentin, SMA and slug. TRPS1 was also found to be positively related with IMP3, which is expressed preferentially in triple negative breast cancers (TNBC). IMP3 is a member of insulin-like growth factor II (IGF-II) mRNA-binding proteins family. It contributes to the migration and invasion of TNBC cells. Thus, TRPS1 may be associated with the migration, invasion, and EMT in ERα-negative breast cancer cells. Ligand-activated ERα could suppress slug transcription through direct association with the slug promoter. Human breast cancers, which lack ligand-activated ERα, may then over-express slug that may downregulate E-cadherin and lead to EMT . We found TRPS1 to be associated with different EMT markers by different ERα status, therefore, ERα might play an important role in affecting the relationship between TRPS1 and EMT markers. Estrogen receptors include estrogen receptor α (ERα) and estrogen receptor β (ERβ). Most studies have provided evidence that ERβ acts as a negative modulator of ERα and indicates a good prognosis with prolonged DFS [34, 35]. Several investigators have found ERβ expression to be positively correlated with poor prognostic phenotypes such as accelerated proliferation and basal phenotype in ERα-negative breast cancer [36, 37]. We also stained ERβ and found its expression to be correlated with TRPS1 expression. TRPS1 expression was not regulated by ER signalling since estrogen withdrawal using charcoal-stripped serum did not affect TRPS1 gene or protein expression in ERα-positive breast cancer cell lines . Thus, we have assumed that TRPS1 might transcriptionally both regulate genes and affect tumour growth and development to varying degrees. There are many possible explanations for the different association between the molecular markers with TRPS1 in ERα-positive and ERα-negative breast cancer. First, TRPS1 is capable of binding to numerous cofactors of various functions. Second, it may either promote or inhibit carcinoma processing depending on the context and amount of protein present [38, 39]. Based on the above results, we conclude that TRPS1 is positively associated with E-cadherin and β-catenin status in ERα-positive breast cancer, while it also has a significant association with mesenchymal markers of EMT in ERα-negative breast cancer. However, further studies with large number of tumours and breast cancer cell lines are required to validate the precise function of TRPS1 gene in breast cancer. PS and GZ conceived and designed the overall study. PS performed IHC and wrote the manuscript. HZ and XJ performed histological analysis and participated in the collection of data. JH and WL performed IHC manual assessment and analysis. MJ analysed the data and did the statistical data analyses. All authors read and approved the manuscript for publication.